Former world light-welterweight champion Amir Khan says he hopes to return to the ring in November. The 30-year-old last fought in May 2016 when he jumped weight divisions to face Mexico's Saul Alvarez for the WBC middleweight title, but was knocked out in the sixth round. A fight against Manny Pacquiao was set for April but was called off. 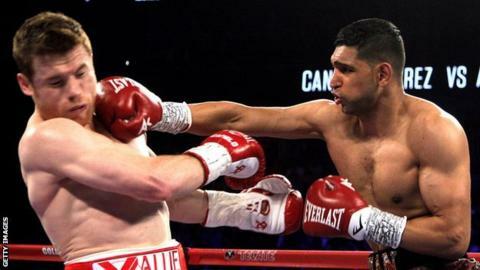 "I've decided to take a big fight at the end of the year and for a title hopefully," Khan said. "I was thinking of fighting at the end of this month but what I've thought of doing instead is fighting after Ramadan - I want to be back in the ring in November." Khan also spoke about world heavyweight champion Anthony Joshua's win over Wladimir Klitschko at Wembley and believes it will give the whole of boxing a boost. Joshua's stunning victory on Saturday took place in front of a post-war British record 90,000 fans as he became WBA and IBF world champion. "What a fight - it was like a Rocky movie, it was a crazy. I think that is what boxing needed," Bolton-born Khan told BBC Radio Manchester. "Boxing is definitely one of the biggest sports in Britain and to see a 90,000 stadium full, that is somewhere I would love to be. "Maybe I could see my career off having a big fight like that and then calling it a day as I've not got many fights left in me now."